A tasty collection of festive holiday cookies that will shine at any gathering. This roundup features shortbread, thumbprint, drop, rolled & gluten-free options! If you haven’t already spent some time making a mess in the kitchen measuring out flour, sugar, and burning your fingertips from tasting freshly baked cookies, it’s not too late! Cookies are like mini presents, with each bite bringing instant joy. As you know, there are endless options, and certainly something for everyone. I’m sharing my favorite classic cookie recipes and gluten-free options so everyone can have a tasty treat! From chocolate chip to melt-in-your-mouth shortbread, any of these ten festive holiday cookie recipes will be a hit! I bet most of the time as you grab a cookie you’re just thinking about how delicious they are going to be, and not so much about what kind they are based on preparation techniques. I don’t blame you, but here are some fun facts on your favorite festive holiday cookies. Drop Cookies: These are soft dough cookies scooped into mounds for baking. You want even portion sizes and space when baking for a uniform cooking time. These tend to have a soft or chewy texture like chocolate chip, oatmeal, and peanut butter. Icebox Cookies: Made from dough shaped into logs or rectangles and chilled. They are sliced and baked and can be rolled in nuts or sugar. The textures are usually more crisp and uniform in color like a pinwheel, checkerboard or shortbread cookies. Bar Cookies: Dough is pressed or layered into shallow pans and cut into portions after baking. Shortbread cookies, drop dough or even brownies can fall into this category. Cut-out or Rolled Cookies: Firm dough is rolled out and shaped before baking. Try to avoid re-rolling as the cookies will become tougher. Classic sugar, Linzer, and gingerbread cookies are typical examples. Pressed Cookies: A soft cookie dough that can be forced through a pastry tip or cookie press. Spritz cookies are a classic pressed cookie, and if you have a cookie press, you can create different shapes and designs. Wafer Cookies: These extremely thin, delicate cookies are made with a light batter that is spread on a cookie sheet and baked. When still hot these cookies can be rolled into tuile or cigarette cookies, or even fortune cookies. This festive holiday cookie roundup features some of these types of cookies so you can have a variety of options! 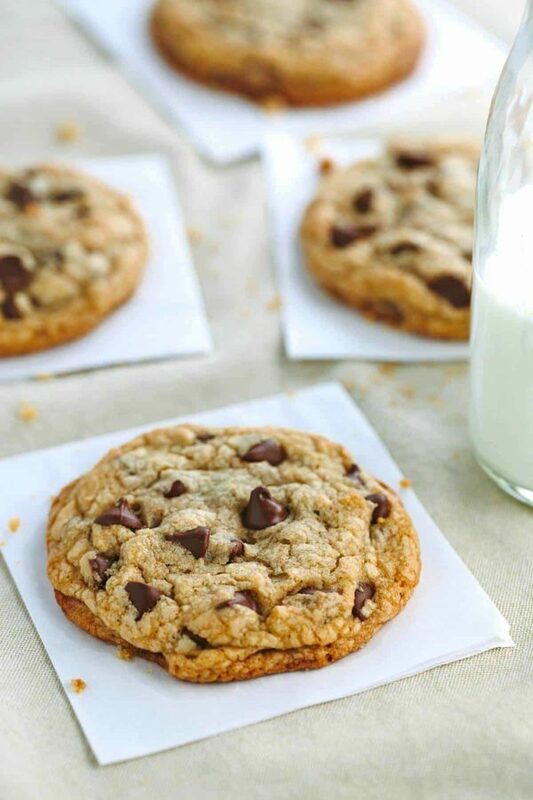 If you are a lover of crisp edges and chewy centers, these chocolate chip cookies will be your new go-to recipe! I use a particular mixing method to create toffee-like flavors and moist centers. I’m confident you won’t be able to let these cool down, they go straight from pan to tummy. One of the essential cookie recipes from our childhood! This is a great cookie to make with kids. They can help you roll the cookie dough balls, unwrap the kisses and press into the dough. For all the kids and kids at heart, these cookies never go out of style. These sweet and buttery cookies are a simple and elegant treat! Just like the ones in the blue cookie tins at the store, but homemade. Create different designs, use a cookie press and package them up for a lovely gift or on your dessert table. This gluten-free recipe is made with just seven ingredients; peanut butter, sugar, eggs, vanilla, and a pinch salt. Just add your favorite jelly in the center, and you’ve got a cookie that will bring you back to your childhood favorite PB&J sandwich in cookie form. This cookie is for only serious chocolate lovers only. These fudgy cookies have unsweetened, bittersweet and semi-sweet chocolate blended into the cookie dough for an intense chocolate treat. There’s a special ingredient added to make the chocolate flavor POP! Milano cookies almost always seem to make an appearance during the holidays. A definite favorite! These copycat crisp and buttery cookies filled with mint chocolate and orange are so easy to make. Bake these gourmet cookies right at home, plus there’s an instructional video! These delicate almond cookies are an elegant cookie made to impress. Filled with fresh homemade cranberry orange jam for seasonal winter flavors infused into each cookie. You can also add your favorite flavor jam if you are short on time or giving these as a gift. These thick and cakey cookies are packed with oats, sweet cherries, crunchy pecans, and delicious white chocolate. Add dried cranberries for a more holiday flavored cookie. Perfect for those who want a sweeter and slightly savory cookie. No one will be able to tell that these almond shortbread cookies are gluten-free! The gluten-free flour blend adds just the right crumbly texture. Mini chocolate chips and crunchy almonds are added to each cookie. Dip in dark chocolate to take the flavors to the next level! Vanilla cookies rolled in cinnamon and sugar, tastes just like a churro! This is one of my family favorites and is an essential holiday treat. This recipe has white chocolate chips for a sweet surprise in each nibble. Instead of making a few dozen cookies, how about creating a JUMBO cookie! This gluten-free and vegan cookie skillet is made with only six ingredients and no refined sugar. Just homemade almond butter mixed with maple syrup, flaxseed, almond flour and baking soda for an irresistible dessert. Grab some spoons, top with ice cream and dig in! I hope these 11-holiday cookie recipes have inspired your inner baker! They are great options for a cookie party, an easy portable dessert to bring to a party or just something to enjoy with your family while you’re in your jammies watching A Christmas Story. Which cookie made you drool? I’d love to hear what you will be baking this holiday season! You read my mind. I was just thinking about making cookies to mail my mom. Now to decide which ones will pack best and still be whole when she receives them. Thank you Jessica! Happy Holidays. You are so welcome Judy! Do you have a good tip for shipping cookies successfully? Your mom is so lucky! Hi Judy- I was looking up best way to ship cookies and Sally’s Baking Addiction recommends to place the cookies together like you are making a sandwich (bottoms facing eachother) and tightly wrap the pairs in plastic wrap. Then do what you were planning and put them in a tin with some tissue paper or bubble wrap. I don’t see any issue of freezing the bread 🙂 Your son is so lucky! What a dear person you are. Thank you for finding that information. I just jotted it down and will send them that way. Oh also good to know about the bread, that you feel it is an ok thing too. I’m getting excited about shipping some goodies now. I was at Ikea today and got my mom two light weight mugs for her coffee too. She has arthritis so these will be perfect for her to pickup and hold with no stress. Christmas is on its way. Cups and books are her birthday present. Her birthday is Dec 23rd and she will be 88. I’m so fortunate she is still here with us. Take care and I bet a lot of holiday prep is going on at your place and two little bundles of joy to make it that much better. If the cookies are round and the approximate size, shipping in a pringles tube is great. (Its wonderful protection. Thank you Pat- that is another great idea. I appreciate your idea. Christmas cookie time. We are taking 6 dozen to a church event Thursday so we will make our baking selection from here. My husband’s going to choose a recipe and bake one too. His first time. Also-our son and my husband got me a KitchenAid stand mixer last year and I use it all the time. It’s the best kitchen tool.